U.S. player Andrea Duran hits a double against Venezuela during their game at the Women's Softball World Championship in Caracas, Friday June 25, 2010. The U.S. won 7-0. Duran will be inducted into the Fresno County Athletic Hall of Fame in November. She is a Selma native. 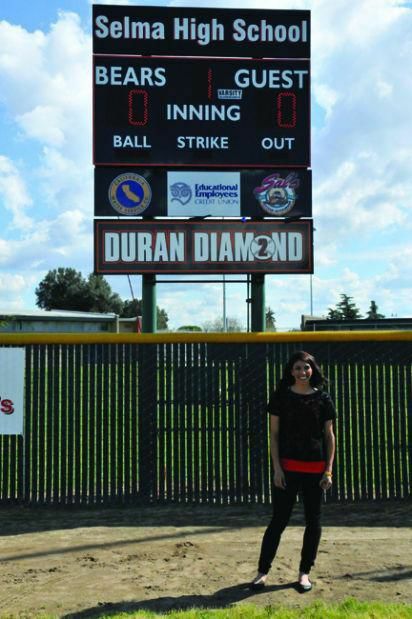 Andrea Duran, former Selma High softball standout, will be one of four athletes and one team inducted into the Fresno County Athletic Hall of Fame in 2019. Duran graduated from Selma High in 2002. The Fresno County Athletic Hall of Fame’s 2019 inductees include two Super Bowl winners, superstars from softball and women’s basketball and two standout teams from the 1960s. The hall’s 61st class was announced April 1. The enshrinement dinner is Nov. 7 at the Fresno Convention Center Valdez Hall. ▪ Andrea Duran, who was a standout athlete at Selma High, played on two NCAA softball championship teams at UCLA , won Olympic silver with Team USA in the 2008 Beijing Games (the last time softball was played in the Olympics) and played nine seasons of U.S. professional softball, including being named Player of the Year in 2014. ▪ Matt Giordano, whose nine-year NFL career included playing on the 2007 Indianapolis Colts Super Bowl championship team. He also played two seasons (2011-12) with the Oakland Raiders. He’s the head football coach at his alma mater, Buchanan High. ▪ Michael Pittman, the fifth-leading rusher in Fresno State football history who went on to 11 seasons in the NFL, was on the Tampa Bay Buccaneers team that beat the Raiders in the 2003 Super Bowl. Pittman was originally approved for FCAHOF induction in 2014. ▪ Adrian Williams-Strong, the Clovis West High graduate who starred at USC and played eight seasons in the WNBA. She was an all-star in 2003 for the Phoenix Mercury. ▪ The 1960 Roosevelt American Legion baseball team that won the California state championship and finished runner-up at the regional finals. That team’s coach, Jake Abbott (1986) and leading player Wade Blasingame (1985) are already enshrined in the FCAHOF as individuals. ▪ The 1967 Fresno Volleyball Club team that won the national championship. The nine-player team included John Alstrom, a 1991 FCAHOF individual inductee. The Hall of Fame will soon have a permanent home inside the Save Mart Center. For more information including enshrinement dinner tickets, fresnoahof.org.